Hundreds of black cabs are to undergo safety checks over fears they may burst into flames. 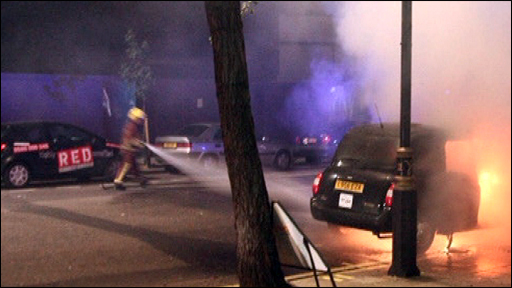 About 670 vehicles have been recalled after seven engine fires were reported in London in the past three months. Drivers of TX4-type cabs with a 56 registration must have their taxis inspected within two weeks, otherwise their licence will be suspended. Transport for London (TfL) said the taxis affected were a "small proportion" of London taxis. The spokeswoman said: "The manufacturer is recalling all TX4s in this registration range to allow further investigation and a thorough safety check of the vehicles' engines which must be carried out within the next two weeks." The spokeswoman said TfL had written to all affected taxi owners and advised them their vehicle must pass the inspection by the deadline or have their licence suspended. "The safety of London's black cab drivers and their passengers is our top priority," she said. Justin Sneddon was driving near Leicester Square when his vehicle burst into flames. He said: "It all happened within two or three minutes, the car was up in six or seven metre-high flames and it was quite an intense fire. "It even took a chunk out of the pavement it was so intense." To date, there have been no injuries to passengers or drivers. Safety checks will be carried out by the taxi manufacturer LTI, which is based in Coventry.